Different types of microinclusions are ubiquitous in practically all kinds of minerals and rocks. These microcavities are filled with a fluid phase of different chemical compositions and of different salinities. In the case of high salinities, so-called daughter crystals (usually halite - NaCl) can be observed. As a rule also a gaseous phase in the shape of a gas bubble occurs (H2O, N2, NH4…). The foul and characteristic smell emitted when breaking or cutting Prokonnesian marble originates by unclenching the inclusions and releasing the gas phase, which in this case contains higher amounts of H2S thus emitting the characteristic odour. Recently this method was developed to obtain additional analytical parameters in cases when other methods fail to pinpoint the origin of white marbles. 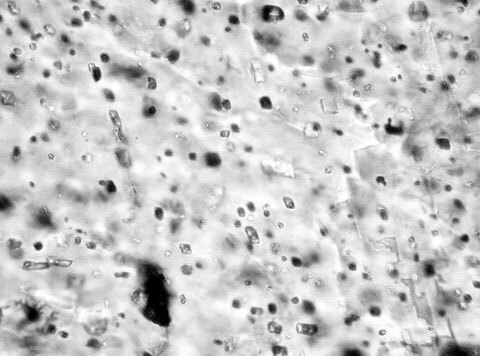 Microinclusions of a size of a few µm in an Ephesian marble. Sand-sized marble grains are carefully cleaned to avoid surface contamination. After mechanical crushing and leaching of the samples the extracted fluid is analyzed by ion-chromatography. Dionex ion-chromatography system for the analysis of the extracted fluids. The compositional fields of some marbles which usually are difficult to discriminate (e.g. Paros II and Prokonnesos) can be separated very well when including the inclusion fluid chemistry results in the multivariate statistical analysis. By the additional use of the fluid inclusion chemistry data to the conventional variables a good discrimination between Paros II and Prokonnesos can be achieved.